The El Tigre in Puerto Vallarta. From reserving tee times to on the course, GOLF IN MEXICO the staff is very accommodating and pleasant. They come around with cold wet towels and water. 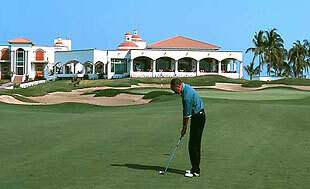 The fairways and greens are at their best condition and each hole is very picturesque puerto vallarta golf. The most memorable one is hole No. 6 with the island green. There are 5 sets of tees. You can play to your level of challenge. The best nuevo vallarta golf treat is coming back to the 18th hole and meeting the baby tiger that is kept ’t wait to go back and play there again GOLF IN PUERTO VALLARTA. For the Paradise Village homeowner or avid golfer looking for privileged access to world-class golf facilities and services, the option of purchasing a membership in EL TIGRE tournamet club makes perfect sense. Among the many benefits, an EL TIGRE Golf Membership offers its members priority championship play with no charge for green fees, plus preferential access to clubhouse facilities, services, events and programs. With some of our membership plans, the average net cost to play golf can be as low as 15% of the normal guest cost!